Romani Imperii occidentis scilicet et orientis, Tabula Geographica. 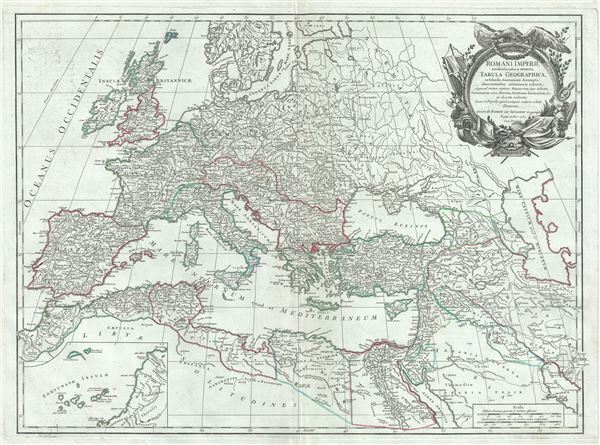 This is a rare and attractive 1752 map of the Roman Empire by Robert de Vaugondy. The map shows the extent of the Roman Empire at its height, including the Western Roman Empire and the Eastern Roman Empire. It extends from the Barbary Coast and Portugal east as far as the Caspian Sea and from the Baltic Sea south to the Red Sea. An inset in the lower left quadrant features the Canary Islands. This map offers splendid detail throughout inclusive of mountain ranges, lakes, rivers, and historical sites. The Roman Empire was established in 27 BC after Gaius Julius Caesar Octavianus, the grandnephew and heir of Julius Caesar was awarded the honorific title of Augustus. During the time of the Empire, Roman cities flourished. Trade spread as far as India, Russia, China and Southeast Asia. However, the sheer size of the empire and its success also contributed to its downfall. After the death of Theodosius I, the Empire was divided between his sons Honorius and Arcadius, who inherited the Western Roman Empire and the Eastern Roman Empire respectively. The Empire declined rapidly and finally collapsed in 476 AD, when Romulus Augustulus was deposed by the German Odovacer. A highly decorative title cartouche by Groux appears in the upper right quadrant. Drawn by Robert de Vaugondy in 1752 and published in the 1757 issue of his Atlas Universal. The Atlas Universal was one of the first atlases based upon actual surveys. Therefore, this map is highly accurate (for the period) and has most contemporary town names correct, though historic names are, in many cases, incorrect or omitted. Rumsey 3353.004. Pedley, Mary Sponberg Belle et Utile: The Work of the Robert de Vaugondy Family of Mapmakers, 38.